Looking For Pet Boarding Services in Northern Virginia? Luckily for pet owners in the Northern Virginia area, NOVA Pets Health Center has everything your pet may need to keep up with their health and well-being. Looking for boarding options for your canine, feline, small mammal, or exotic pet: We have you covered. Learn more below about what boarding options could work for you, your pet, and your families lives. There are many reasons that your pet may need boarding services. All services first require a quick meet and greet where we get to know your pet, their attitude, medical/personal history, and behavior. The most simple boarding situation would be for groomed pets who have been dropped off by owners. Some pets do not respond well to the drying process so they would be placed in a boarding kennel to air dry until the owner returned to pick up their pet. This is temporary boarding requires no additional work from the owner. Maybe you are having a big get together at your place of residence and your pet runs a risk of getting loose or overwhelmed with all the people that will be in their space. Short term boarding is available for you to get your party together without having to worry about your pet chewing up decorations, getting in the way in the kitchen, or getting rambunctious while your guests are having a good time. Moving can also be stressful for you and your pets. 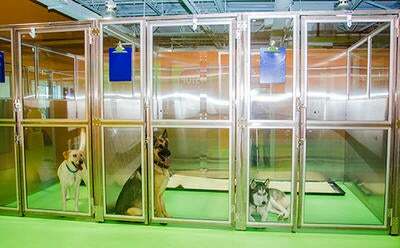 Temporary boarding could be a viable solution for you to focus on your move so that your pets can be introduced to their new environment without the chaos of jumping in and out of vehicles, barking at movers, or hiding out of fear. Illness in your home could also play a factor in your boarding decisions. If you end up catching a bug or virus that may require extended healing time, it may be beneficial for you and your pet to be boarded so that you can have the time to get well and your pet can keep up with their normal level of activity without too much effort on your part. Thinking of going on vacation? Boarding services ensure that your pet it taken care of as if you had never left. This gives your pet their own space to move around, play, eat, and sleep. You pet will be kept on their normal eating schedules and taken outside to have potty breaks throughout the day. Optional day camp, walks, treats, and private play time are all additional options to add for your pets stay as well. For more information about our boarding services at NOVA Pets Health Center click here! Give us a call to set up a tour of our facilities so you can see where exactly you pet will be housed during their stay with us. Anxious while your pet is boarded? Give us a call or email us for an update or even a picture of your pet during his or her stay with us.